For hunting practice, nothing can be more frustrating than having broadheads that won’t group like a practice point. Inaccurate broadheads erode confidence and make it difficult to put an arrow in the vitals when you’ve finally earned the shot. SEVR broadheads address this issue in two very important and innovative ways. First, SEVR’s patented, pivoting rear-deploy blade design keeps the blades fully contained during flight. The reduction in surface area offers true field-point-like flight characteristics. Secondly, SEVR’s exclusive Practice-Lock™ feature locks the blades into the ferrule and allows archers to practice with actual the broadhead they use while hunting. Because the blades stay locked inside the ferrule, shooting into foam targets won’t dull blades. 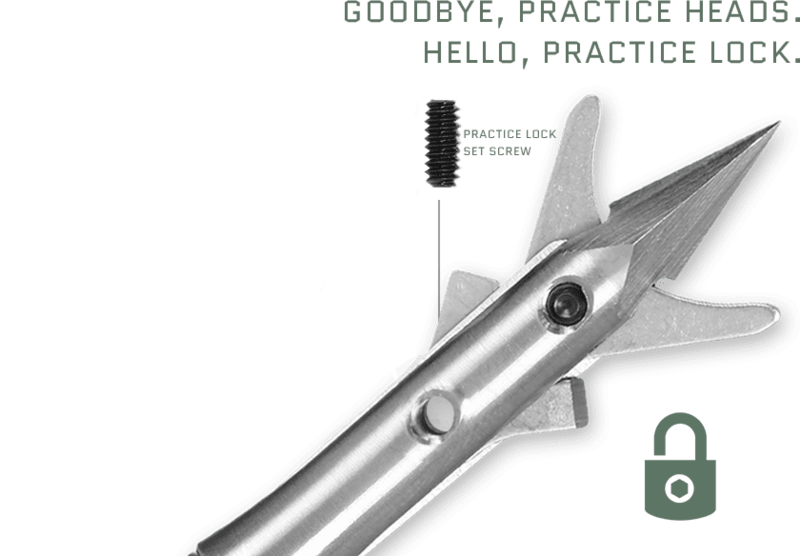 Additionally, the innovative design eliminates the need for a clunky practice head that may or may not shoot exactly like the broadhead it’s trying to mimic. For seasoned bowhunters, the advantage is clear—practicing with same broadheads you hunt with means you know exactly how your arrows will fly and where they will hit when the big moment comes. Bowhunters no longer have to “hope” that their hunting heads will fly the same as their practice heads—with SEVR broadheads, they are one and the same. Sold single-packed in any quantity desired. Keep up with the latest information from SEVR. We only send the information you need. SEVR Straight Through to the good stuff. New, unused and unaltered items may be returned for refund within 30 days of receipt of your order. Items returned after 30 days will receive web store credit only. All returns must be pre-authorized by SEVR and receive a return number prior to sending the product. Please see Sevrbroadheads.com/returns for full details on returns and exchanges and to request a return number. Returned items must be in new, unused, and re-sellable condition. If you are dissatisfied with one of our products, please contact us and we’ll make it right. SEVR broadheads carry a limited-lifetime warranty against manufacturer defects and workmanship. SEVR will repair or replace qualifying items at our discretion.